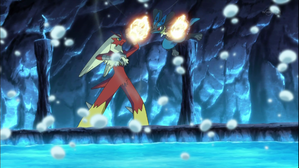 » Episode Guide » Viewing Episode: ルカリオVSバシャーモ！試練の洞窟！！/Lucario VS Burshamo! The Cave of Trials!! Corni and Lucario! The Secrets of Mega Evolution!! Mega Lucario VS Mega Lucario! A Storm of Wave Guidance! !